Baillie Station is an elevated station on the Portland El in Portland, Liberty City in Grand Theft Auto III and Grand Theft Auto: Liberty City Stories. It is located at the border of Portland's Saint Mark's and Portland View neighborhoods. The station is located along a hilly tract of land that experiences a sharp drop (traveling in a southern direction) in altitude, making Baille both the lowest (at the northern end) and highest elevated station (at the southern end) in Liberty City. 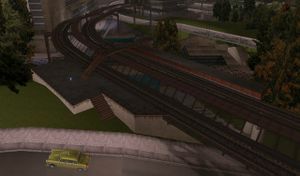 In Liberty City Stories, there is a Sanchez parked on the northern platform that initiates the Wong Side of the Tracks side-mission. Like other stations in the city, the station is originally unnamed in GTA III. The station's name was later retconned as "Baillie Station" in GTA Liberty City Stories, being likely named after Keiran Baillie, one of the 3D artists for GTA III. The station in GTA San Andreas. The station also appears in GTA San Andreas during the mission Saint Mark's Bistro. It is however unsolid, and jumping into it will cause the player to plummet many feet below the area into invisible water. This page was last modified on 12 March 2012, at 11:53.